I’ve just returned from a fantastic weekend sailing on the Solent! The weather conditions were perfect and we had two great days of sailing. The boat is called Sea Scamp and she is a 1930’s built wooden 41 ft boat, once owned by the Luftwaffe, who used her to teach pilots navigational skills between the wars! She really is beautiful and sails fantastically. 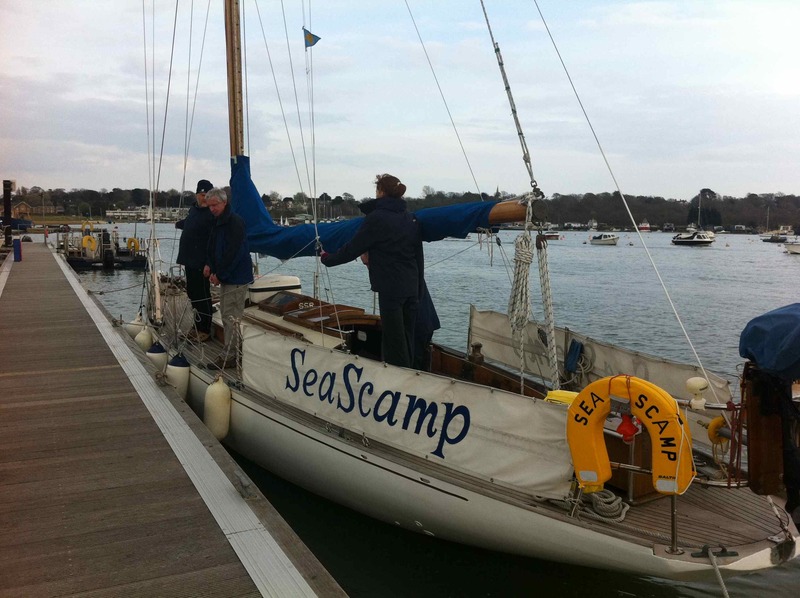 I first sailed on her last May and was instantly hooked, so joined the Sea Scamp syndicate. I was due to go on a week-long trip from Oban last Summer but unfortunately it got cancelled. The skipper on this trip was Mike Sharples (a colleague of mine now based at the Open University), the other crew were Sarah (first mate), Martin, Steve and Florence. I am very impressed by how professional the Sea Scamp syndicate is – the skipper and first mate are always fully qualified day skippers, at the very least. Instructions on board are clear and there are lots of good sailing books, charts and manuals. Everyone else met at the pub on Friday evening, unfortunately I was travelling down from Edinburgh so joined on Saturday morning. We set off soon after nine having had a safety briefing first and headed over to the Isle of Wight. The winds were force 4 to 6, so perfect for getting the sails up. We headed across and west. We anchored for lunch in Thorness Bay. Mike had got lots of nice food in, so we had quiche, rolls and salad. It’s amazing how hungry you get when sailing! We then headed along the coast east towards Bembridge, enjoying the lovely scenery as we went. Bembridge is quite tricky to navigate into, there is a narrow, winding channel that you need to follow, but we had great instructions and photos to guide us in. We arrived and moored up early evening, before heading to the pub, taken the scenic, if slightly longer route there. 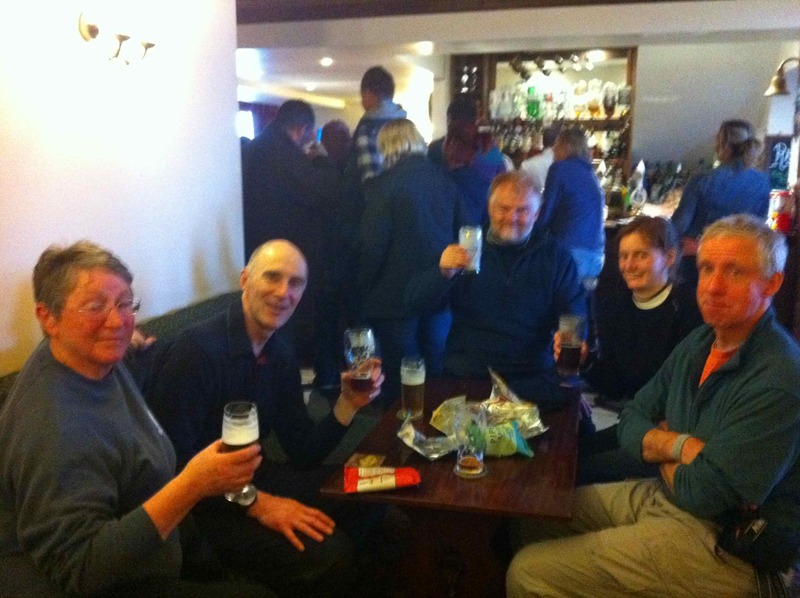 We enjoyed a couple of pints and a mountain of crisps, before heading back for dinner that Mike had ready for us. Then a reasonably early night, before getting up at 7 on Sunday – so that we could be off by 8. We sailed along the coast to Osborne bay where we had a delicious brunch of egg and bacon sarnies – perfect! Food tastes delicious when you are sailing. Take soups for example. I admit I am a bit of a snob about soup, and much prefer homemade soup to shop bought variants. However, on a boat cup-a-soups tastes delicious, seriously try it! Then we headed back to Southampton. We had to navigate through a race; hundreds of beautiful boats with colourful spinnakers up, we saw one boat where the spinnaker split. I was very impressed by how quickly they got it down and carried on with the race. Navigating was interesting to say the least with all the boats and the huge tankers, unbelievable how busy the Solent is! We arrived back at Shamrock Quay at two and were all done with tidying the boat etc. by four. Both Mike and Sarah are great teachers, and little by little I feeling I am beginning to learn the ropes – I think I have finally got how to do a bowline in my head – rabbit comes up the hole, round the tree and down again lol! It was a fantastic weekend, great sailing and nice company. One of the things I love about sailing is that it attracts people from all walks of life, it doesn’t matter what you do for a living; you are connected by your passion for sailing. There is always great conversation – tales of past trips and near disasters, places visited, people encountered. There is sometime magical about sailing, the combination of the achievement of getting somewhere under sail, the complexity of learning the ropes and navigational terms (‘horse’ and ‘windex’ were new ones for me! ), the food, the company, the exploration of somewhere new, and the being rocked gently to sleep at night, warm, comfortable and well fed. A great trip; excellent memories, I look forward to the next adventure! My photos from the trip are here.